In Kotkapura, out of 16 Panchayat Samitis (PS), the results of 10 were declared till around 7 pm Saturday out of which only one was won by SAD and the rest by Congress. ALTHOUGH SAD was actively involved in the campaign of rural polls and had even organised two major rallies in Abohar as Pol khol rally and Zabar Virodhi rally in Faridkot, the results were not in their favour in Malwa, considered the party’s stronghold. In Kotkapura, out of 16 Panchayat Samitis (PS), the results of 10 were declared till around 7 pm Saturday out of which only one was won by SAD and the rest by Congress. In Bargari, where dharna by Sikh organisations is on since June 1, the Congress candidate was leading and the final result is awaited. Repoll had happened in 54 polling booths in Punjab following complaints of booth rigging and poll violence out of which the maximum happened in Lambi and Malaut in Muktsar on 36 booths and interestingly, these are the two areas where SAD is leading. Out of total 23 seats of PSs in Malaut, SAD has won 10 while BJP came as a face-saver on one seat while Congress won seven seats and one seat went to an Independent. In Lambi, which happens to be the constituency of Parkash Singh Badal, out of the 25 PSs, result of nine had been declared and seven out of them were SAD candidates. After much drama, the district administration gave winner’s certificate to SAD candidate Shalinder Singh who won with over 400 votes from Mamdot zone of Zila Parishad elections in Ferozepur. He had defeated a high profile candidate, Naseeb Singh Sandhu – PA to Sports Minister Rana Gurmeet Singh Sodhi. Shalinder claimed that he had won the election but administration was not giving him the certificate and instead had started re-counting. He staged a dharna outside Mamdot counting centre and from 5 pm onwards, he along with former SAD MLA Joginder Singh Jindu and others blocked Ferozepur-Fazilka state highway for four hours amid heavy rain. Sources said SAD President Sukhbir Singh Badal was planning to join the protest. It has been learnt that SAD workers even did stone pelting on the vehicle of Rana Sodhi’s son Heera Sodhi and had even argued with the district police. Late in the night, ADC Gurmeet Singh Multani finally gave certificate to Shalinder declaring him winner. In a ‘silver lining’ for the Lok Insaaf Party, it opened its account from Malerkotla by winning one PS seat. However so far as per the declared results, out of 193 seats- results were declared on 145 PS seats and 115 were won by Congress while SAD could win only 18 seats in this district. Even in Bathinda, so far as per poll result of PS seats, out of 109 declared results, SAD could get only 12 seats while Congress formed majority with 86 seats. The result of a few seats was still pending. Here, it was a clear majority to the Congress. SAD won 34 seats of PS out of 200 while 161 were bagged by the Congress. Even in Zila Parishad seats, of 25, 12 were won by Congress and leads of Congress were going on the rest seats as well. Even in Barnala’s PS poll results SAD could win only 6 seats out of 33 declared results while total seats of PS are 61. SAD (Amritsar) opened their account in Barnala by winning one seat in Mehal Kalan zone. In Kotkapura, there were 16 panchayat samiti zones out of which on 14 Congress was declared winner while SAD managed to win only 2 seats. SAD lost Bargari zone seat to Congress. In Bargari village, Darshan Singh of Congress won from Bargari zone. 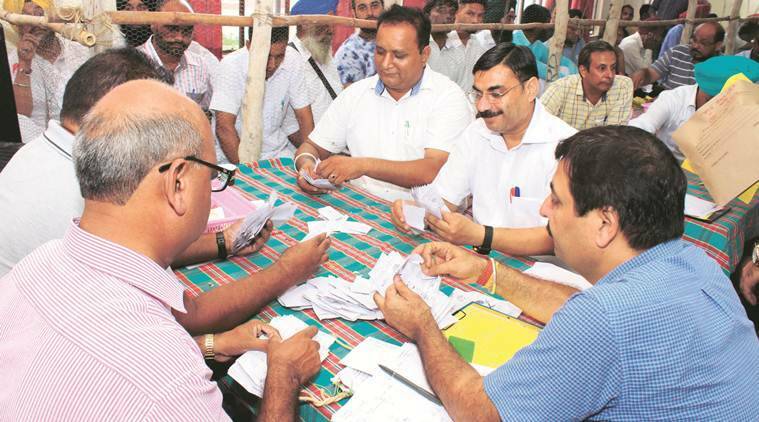 Though Fazilka comes under BJP’s quota in seat-sharing, however in PS results out of 18 declared results, BJP could win only four while CPI opened its account by winning one seat and the rest 13 were won by Congress.